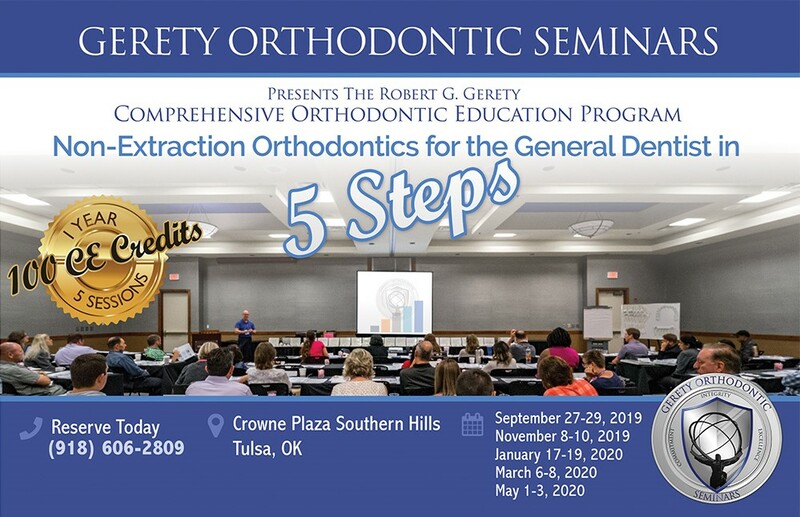 Gerety Orthodontic Seminars is dedicated to providing the highest quality orthodontic education to general and pediatric dentists, which includes the successful integration of orthodontics into your practice. There are many ways we can help you to obtain your goals of expanding the services that you offer to your patients. Gerety Orthodontic Seminars offers a diverse range of courses both online and in the classroom, we provide online diagnostic help in between classroom sessions and our continued support to each and every student after graduation is unparalleled. Our mission is to help you be successful in orthodontics and enjoy the process! We offer a complete program of orthodontic education that is structured for the general dentist who has no orthodontic experience other than what was presented in dental school. Our curriculum was developed and taught by Dr Robert Gerety for over 40 years and has been the only true Gerety program taught with his guidance and support. There are 3 types of courses that we feel are vital to not only your initial learning but to your continued successes. The first type of course is providing the dentist with a thorough and complete orthodontic education, which is our Comprehensive Orthodontic Education Program, a series of five sessions. The second type are courses that are dedicated to teaching your dental assistants how to help you accomplish your goals, which is Kay’s Assistant Training Program. The last type is our Annual Symposium which is focused on advanced mechanics with an emphasis on case finishing. This annual meeting is a great way to review techniques and discuss new trends and products. Regardless of your orthodontic education goals we have the solutions for you and your office team, and we have the flexibility to offer instruction in the classroom and online! To view our full line of ONLINE courses, click on the Continuing Education tab from our homepage. We are excited to be offering the following classroom courses in 2019 and we hope to see you there! For more information please call us at 918-606-2809 or email us at customer-service@orthodonticteaching.com. The success of a dental practice, and the successful incorporation of orthodontics into a practice, can hinge on the education and training of its staff. This hands-on course is designed to meet the needs of doctors and assistants who are currently utilizing Straight-Wire mechanics and would like to expand the duties that may be delegated to, and performed by, the assistant. You can’t afford to miss out on the opportunity to train your staff to accept these responsibilities and to encourage their professional growth. This is a beginning course specifically designed to teach the fundamentals of orthodontics to chair-side auxiliaries. No experience is necessary to succeed in this course and there are no orthodontic prerequisites. This is a two-day course featuring lectures, demonstrations, and hands-on exercises. Our instructors, Kay Gerety and Chris Locker, will provide your staff with a clear understanding of orthodontics beginning with patient records, and building on each lesson to conclude with bracket and archwire placement. Scheduling and practice management, ordering orthodontic supplies, operatory armamentarium, and set-up. 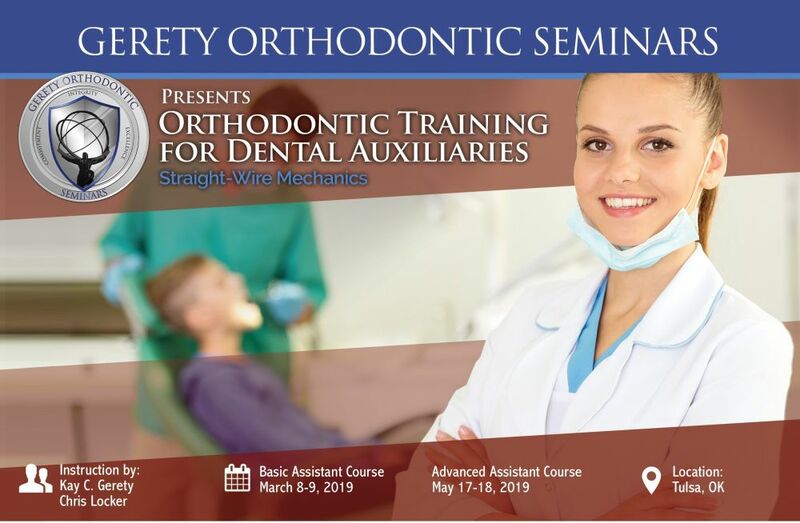 This 2 day, hands-on course for experienced Orthodontic Assistants is designed to meet the needs of doctors and assistants who are currently utilizing Straight-Wire mechanics, and would like to expand the delegable duties to be performed by the assistant. Although it is not mandatory to have participated in "Kay Gerety’s Basic Assistant Course," this advanced course is specifically structured to enhance and develop the principles and techniques taught in the basic course. Additionally, it will provide an excellent follow-up for assistants who have previously participated in the Basic Assistant Course or who have extensive experience in orthodontic assisting. It is recommended that participants be familiar with taking basic orthodontic records, bracket and molar band placement, ligation methods and basic wire changing techniques. Each assistant needs to be comfortable with basic orthodontic procedures. In order to fine tune and detail orthodontic cases we must be willing to spend a little extra time, closely examine every minute detail, and completely understand the system of case finishing mechanics: 6 Keys to Optimal Occlusion. This 2 ½ day program will focus on beginning to finishing mechanics and utilizing the proper tools to best resolve the issues in the most effective manner. Just as a pilot has his procedures to follow, we will present our proven techniques to help you achieve new heights and soar to case finishing excellence. We will begin with the pilot’s flight planning and preflight checklist, records and diagnosis, and hit the runway and cruise with our treatment options and archwire mechanics. In case of a bumpy flight we have contingency plans and then will prepare you for the final approach and smooth landing. 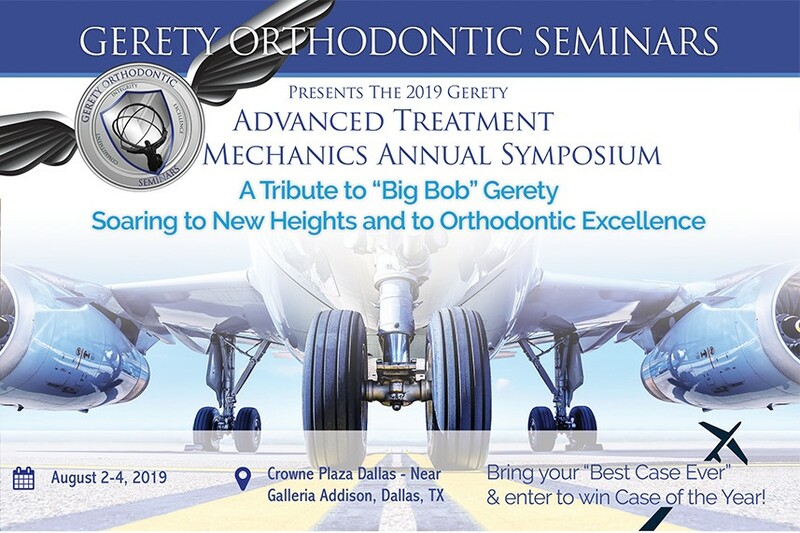 We have many new ideas and solutions to help you navigate your cases and believe this program will help you in your pursuit of orthodontic excellence. This 2 ½ day course is structured for the doctor that is currently practicing the Straight-Wire technique, has a clear understanding of mechanics and the Straight-Wire philosophy, and is looking for a program to update and expose current trends and techniques in orthodontics, in particular, those applying to case finishing. While maintaining our core philosophy and mechanics, we will explore and expose new development in appliances, materials and products as they pertain to some of our more advanced or complicated cases. There are definite advantages and disadvantages that we have encountered and we will be presenting these mechanics and defining our guidelines for determining when one appliance may be indicated over another. We are proud to announce our collaboration with Dr Jamison Spencer from the Spencer Study Club, who will be our guest speaker for a half-day on Sunday, August 4. Dr Spencer is one of the country’s most sought after and respected authorities on TMD, Airway, and Dental Sleep Medicine. We have been exploring the potential correlations between non-extraction orthodontics and the effects on the airway. Dr. Spencer will provide us with insight and information that will produce immediate benefits in our dental practices! Do you have a particular task or procedure that you would like to see demonstrated? Bring your questions to the meeting and we will have a demonstration clinic immediately following class on Friday. Meet with the five instructors for a clinical session presenting any specific mechanic or procedure that you would like to see completed. This is also an excellent opportunity to bring any cases that you would like some help or guidance with. We have asked each of our instructors to bring the case they are most proud of to present at the meeting, and we invite each of our participants to bring their best case to present, too. Each of the cases presented will be evaluated by our judges and one winner will be awarded with the Robert Gerety Case of the Year. The winner will be presented with an engraved award and will receive a lifetime membership to our website and 10 cases of brackets. 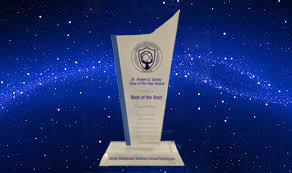 What a great promotion it will be for you to show off this beautiful award in your office! We are looking forward to you sharing your success story with us! Gerety Comprehensive Orthodontic Programs are committed to incorporating the most current and enhanced orthodontic concepts as we teach the General Dentist to master orthodontics and to successfully integrate it into their general practice. Our course is taught in Tulsa, OK utilizing the same core principles and techniques created, perfected and documented for over 35 years by Big Bob himself. Maintaining the same high standards, today’s Gerety team lead by Kay Gerety, continue to present Big Bob’s curriculum while adding their innovations, new cases and mechanics, updating materials and products promoting cutting edge techniques and technology in the classroom. Our student- teacher ratio and continued support is unparalleled to any other program. Our team of 5 instructors provides each student with dedicated individual support in and out of the classroom, proving our commitment to your success! This course will show you innovative solutions that will make orthodontics fun, easy, rewarding, and profitable. The addition of orthodontics to your practice not only increases your profitability, but also adds a new and challenging dimension of service to your patients and practice. This course is ideally structured for the general or pediatric dentist with no orthodontic training other than dental school. Just as you have learned a technique for every other aspect of dentistry, Dr. Gerety’s method of teaching orthodontics will also provide you with a predictable technique. Each session builds on information, presented in the same sequence you will encounter in treatment delivery. When you have completed this course, you will have the knowledge, skill, and confidence to treat 80% of the malocclusions that come into your office. The lecture will include both didactic and hands-on instruction with typodonts to facilitate your understanding of our curriculum. Each and every procedure is supported with a detailed slide sequence, patient cases demonstrating the technique, a video demonstration of each of the 15 clinical projects, and a new hands-on photography module added so each student can produce a complete set of images that meet the standard of care guidelines. Participants will receive individual assistance in completing the hands-on projects during each session. Do you think you might have a conflict with one of the dates? We can help. Because our entire program is also available online we are offering access to our online course to use as a study resource allowing you to make-up missed sessions or to review the material in between sessions. It is a perfect opportunity to have access to the best of both of our programs, have the personal interaction of the classroom and have the lecture material and project videos available to review as often you need to online. Over 10,000 dentists have attended the Gerety seminars over the past 40 years—you probably know several of the attendees. We hope that you will visit the Testimonial page on our website to see what our students are saying about our program or call Gerety Orthodontic Seminars at 918-606-2809 and ask for a Gerety student in your area. Feel free to ask questions, and speak with them candidly about their experience.